The sea again. Its magic lure drags Steve, Alan, Paul and me off to seawatch, anywhere on the East Coast where, according to the weather forecasts, the wind should be suitable for our porpoise (as the spell check suggested). We decide to go to some place where we can seawatch but where there is also another specific bird to look for. 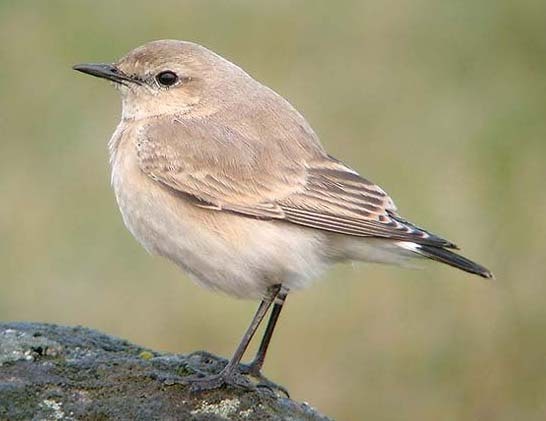 In that case, we must head for Flamborough where there have been reports of a Desert Wheatear although there are no details to hand of either its exact location or its plumage. We arrive at about 8.30 a.m. and there is a lovely light foggy drizzle drifting around the cliff tops. Not too pleasant for the birdwatchers but brilliant for keeping down any lost little vagrant passerine. 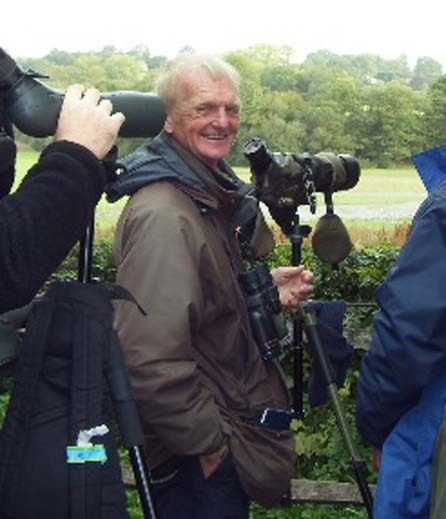 There are other birdwatchers around, all looking for the relevant little bird. We find a somewhat peculiar female wheatear within half an hour, and then another, and another. We soon realise that all female wheatear are somewhat peculiar. None of them seem to have a consistent set of plumage features that they have in common with all the other female wheatears. Nothing for it. We set off down to the lighthouse for a sea watch. Same old place as ever – we set up our telescopes on the slope below the main cliff edge and start watching. 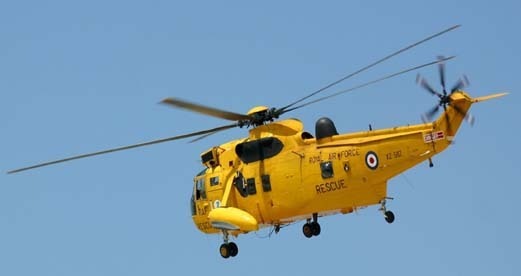 No sign of Flamborough’s most famous birdwatcher, its very own “Mr.Sea Watch”, Brett Richards. There are some Arctic Skuas moving through and we are able to study their piratical antics in some detail. After about ten minutes I see one all dark bird flying steadily and heavily northwards. Then it seems to remember its error and sweeps back around in a huge arc. Then it starts flying around in very large circles as if it is by now completely confused. On the other hand, it could be some vaguely half remembered display flight of some sort. Whatever the case, it finally stops its circling, makes a half-hearted attempt to harry a Kittiwake and then heads off out to sea. 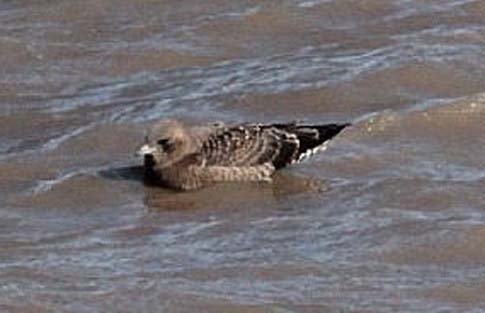 We all pick the bird up and we all agree that at long last, we’ve seen a Pomarine Skua. It’s bigger than all the Arctic Skuas and it’s obviously not a Great Skua. Its flight is heavier than an Arctic and its behaviour is completely different. Every Arctic we have seen today has been energetically and enthusiastically chasing Kittiwakes in a most agile and nimble way. They are all darting, lightly built birds that at no point have shown the slightest inclination to soar or circle like some marine Common Buzzard. Ten minutes later I find another large and heavy skua but this time, it’s down on the water. Again, its structure is much more solid than the Arctics, its bill is more substantial, its body weightier, and it even has what may well be rudimentary spoons sticking up into the air at the back end. We watch it for a good twenty minutes as it cruises around, well separate from the rest of the birds on the water. 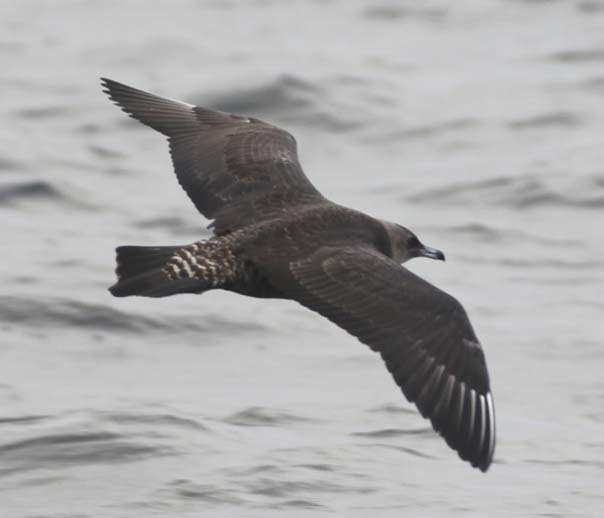 We are all satisfied that it is a first winter dark phase Pomarine Skua. If we think we’ve had a difficult time of it with bird identification so far, then we are sadly mistaken. In the next half hour or so, we’re going to get into very deep water indeed and I don’t mean falling off the cliff. We still have the best part of a sunny afternoon left so we decide to walk slowly round to see what we can turn up in the way of migrants. It’s really rather pleasant. A nice day, a blue sky and the hope that more or less anything might be out there for us to find it. We turn up any number of Northern Wheatears, both male and female and a Short-eared Owl, that looks very pale and which we try very determinedly to turn into a Barn Owl, but without any success, because in the final analysis, we just can’t ignore those dark carpal patches. We stop at the top of the cliffs, a little way south of the lighthouse at a point about fifty feet or so above the sea. 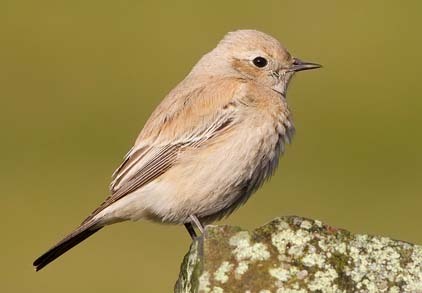 There are lots and lots of wheatears here, flitting around, most of them near some kind of ruined wooden landing stage. Alan soon spots what he thinks is a funny wheatear and we all set up scopes to examine it more closely. The first and most obvious feature about it is that its eye stripe is not as fully developed as the other birds. It seems to be more buffy, even russetty, in colour and seems to begin further back on the head, almost behind the eye itself. The bird, a female, is obviously tired and is harried and picked on by all the other birds. Nevertheless it keeps returning to the landing stage steps and eventually begins to preen. That’s when we realise two interesting things about the bird. Firstly, its tail, as far as we can see, is completely black and although it has a smallish area of white in the top two corners, this is really no more than a slight curvature of the line between the white rump and the black tail. It is completely different from the T-shaped pattern that we have been looking at all day, more or less, on all the other Wheatears. Indeed, we’ve even noticed that with every Northern Wheatear that we’ve seen, this T-shaped pattern may even be visible when the bird is at rest. Not the case with this bird. 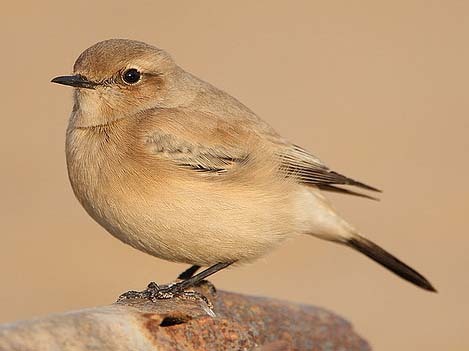 The second feature, and for me, the one that clinches it as a female Desert Wheatear, is the fact that as the bird lifts its wing to preen, it reveals a snowy white underwing which is absolutely and totally white, except for a darker line on what must be the trailing edge. For weeks after this I look at Northern Wheatears and cannot find a single one, either in real life or in photographs, that comes even close to our mystery bird in the whiteness of this underwing. There is not a hint of brown or buff, just a brilliant white like a patch of bright fresh snow. This bird, however, is not terrifically distinctive except for these two features and the eye stripe. This differs slightly from the Northern Wheatear but, in truth, if there is supposed to be a major difference in basic plumage, then there just isn’t one. It is perhaps a little peachier in colour but is not really fundamentally different from the Northern Wheatears that continue to chase and harry it. It is at this point that our problems start, because, as I later suspect, the mystery bird flies off without our noticing it, perhaps because the cliff is overhanging at this point and there is a vast area underneath it that we cannot see. It is certainly impossible to see the comings and goings of every single bird. A few seconds later, a Wheatear of indeterminate species comes to perch on the landing stage, just as our bird has on several occasions in the past few minutes. A small crowd of some ten or twelve birdwatchers has by now assembled, all trying to see whatever we’re looking at but apparently too shy just to ask us. We lead them to believe that this is the mystery bird even though we have not yet seen either its tail or underwing to confirm this. 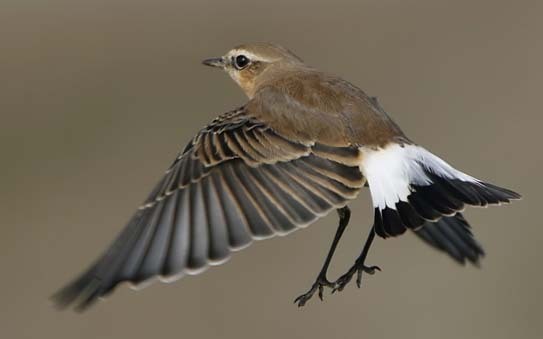 When the bird flies away, of course, it has the T-shaped pattern of an ordinary Northern Wheatear and this leads a high percentage of the new onlookers to think that we are a bunch of complete village idiots. Well, we are, but on the other hand, I know what I saw. 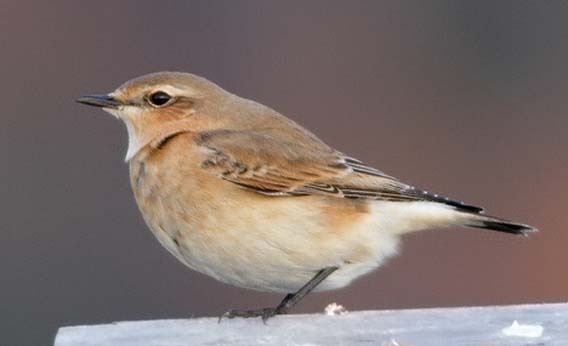 And yes, I am more than a little put off by the episode at the end when I was fooled by the Northern Wheatear on the landing stage, but Steve soon calms me down. He makes the valid point that whatever has happened subsequently, we did all four of us see a female Wheatear with an all-black tail, and an all-white underwing, whatever antics the bird got up to afterwards and whatever skilfully designed imposter came along its place. And surely even the most aberrant of birds could not have two diagnostic features of another species? That discovery would knock the Rarities’ Committee back a bit. The whole appalling business does have its funny side however, because as soon as the assembled group of eight or ten becomes fifteen or twenty, this is easily a big enough crowd, particularly here at tight-lipped rare-bird-suppressing Flamborough, to attract an even greater number of birdwatchers. 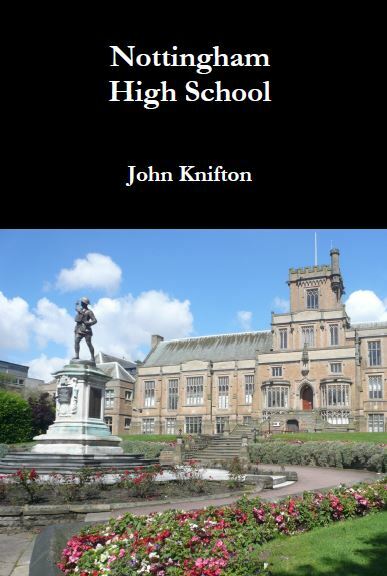 Very quickly, we have seventy or so people, all looking downwards with great deliberation. Our final gesture is a last bit of seawatching as we give up hope that our Desert Wheatear will return to its original spot and we soon get a superb bit of unusual bird behaviour. 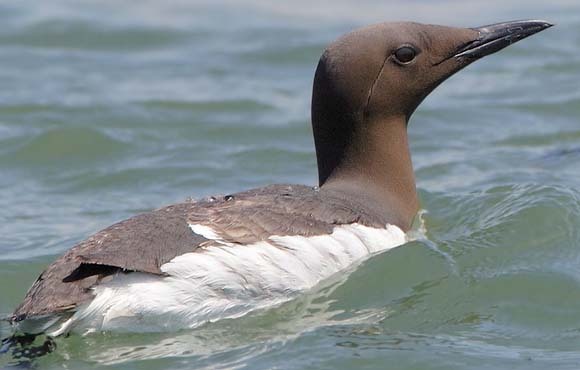 It’s a Guillemot that is performing some bizarre sort of preening ceremony that seems to consist solely of the bird lying flat on its back in the water, with only its beak and its little legs sticking out above the surface. 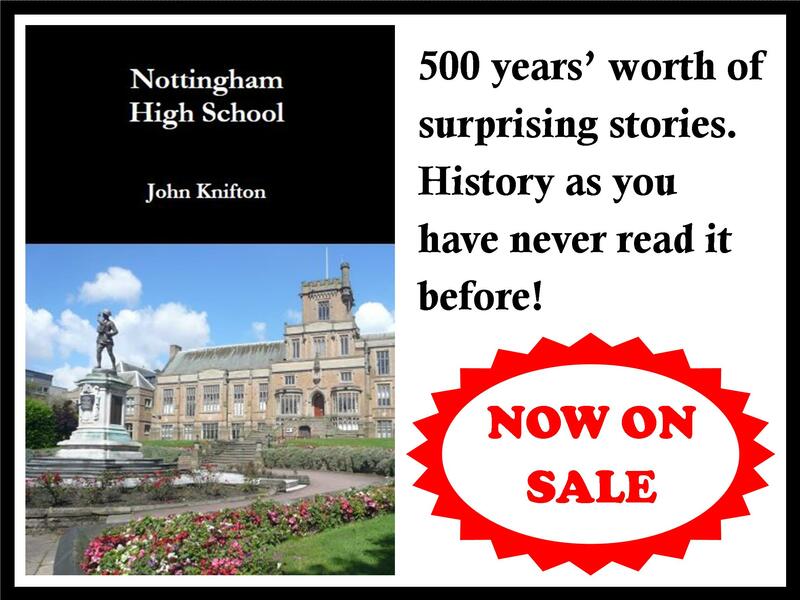 It remains motionless for minutes on end so that it looks just like a man bathing in the Dead Sea or a gigantic dead fly floating around in the bath. A strange end to a puzzling day. Are you planning a revisit? When I was in Dorchester in the 90s, I thought it heaven on Earth. I’d give anything to drive to the English coast. Alas, I now suffer from back problems and I cannot drive very far. My ambition is to revisit Cornwall but I do remember staying in Dorchester on a family holiday a few years ago. We all loved visiting Thomas Hardy’s house deep in the woods.